Halve peels away the layers of orderly narrative with which we try and tame the chaos of mourning. At once frank and elusive, Jipson’s poems resist the pull of storytelling and personal confiding, instead using formal variation to embody emotion and memory. These poems lay bare the experience of losing a brother and evoke the haunting that results as language fails to contain either grief or the love that precedes such a loss. Kristina Jipson’s Halve peels away the layers of orderly narrative with which we try and tame the chaos of mourning. At once frank and elusive, Jipson’s poems resist the pull of storytelling and personal confiding, instead using formal variation to embody emotion and memory. These poems lay bare the experience of losing a brother and evoke the haunting that results as language fails to contain either grief or the love that precedes such a loss. these rooms of every sound. 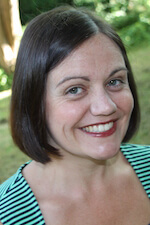 Kristina Jipson holds an MFA from Columbia University and a PhD from the University of Notre Dame. Her poems have appeared in American Letters & Commentary, At Length, Chicago Review, Colorado Review, and DIAGRAM. She is the author of two chapbooks: Lock, Means (Dancing Girl Press, 2011) and How Void of Miracles, (Hand Held Editions, 2009). She teaches in the Seattle area, where she lives with her husband and two daughters.